Kalahandi is one of the most backward districts of Western Odisha. Persistent crop failure, drought, starvation, malnutrition, child selling, distress migration, illiteracy are rampant in the region. Thuamul Rampur is a tribal-dominated block in the district that is no exception. The population here belongs mainly to the Kondha Paraja tribe who have traditionally depended on two things for their food requirements: one, shifting cultivation of subsistence crops or dry land farming primarily dependent on rainfed water, and the other, collection of Non Timber Forest Produce. Unfortunately, both practices were largely unorganised and rarely ever adequate to meet the families’ needs. Moreover, the extensive use of synthetic fertilisers, pesticides and high yielding mono-crop resulted in increasing loss of crop varieties, erosion of genetic diversity and extinction of local seeds in the region. Traditionally, land was devoted to crops grown solely for the market, leaving the family with little or no home grown food. The losers in the process were the so-called ‘’poor people’s crops’’, that have less importance for the international market, but are crucial for supporting the local subsistence economies. All these factors in combination perpetuated the fragility in livelihood of the tribal people and ultimately led to distress migration in the region. At this point, Agragamee, a voluntary organisation committed to the upliftment of the scheduled tribes and other marginalised sections in several districts of the region, stepped in to promote self-reliance in farming among the people of several villages here. Orchard development was initiated along with the revival of intercropping and crop diversification in these villages of Thuamul Rampur block. Prime focus was given to settled agriculture, building indigenous knowledge base of the tribal farmers through encouragement of organic farming methods, preservation of local seeds etc. Financial support came to Agragamee from the government through the Integrated Tribal Development Agency (ITDA), Kalahandi, and organisations such as International Partnership Agreement Program, Christian Aid, and Raghuraj Foundation. Guided by the philosophy, Agragamee has opened up avenues for organically grown produce in the region. With the support of ITDA, Kalahandi a Wadi project was implemented in 15 villages of Adri and Gopinathpur panchayat during the project period of 2010 to 2013. Under this project, farm inputs such as mango and lychee saplings have been provided to 200 farmers covering 189.50 acres of land. Two or more crops were selected in the Wadi plots to minimise climatic, biological and marketing risk. As a part of optimum land use and to cater to short term livelihood needs, intercropping and diversification of a range of crops, grams, pulses and vegetables were advocated. For example, vegetables like tomato, brinjal, beans, chilly, pumpkin and various pulses such as cow pea, arhar, and black gram were grown by the farmers under the project. Millet being a key staple food among adivasis, Agragamee promoted a range of millets such as Finger, Barnyard, Foxtail, Little and Proso amongst the farmers. Many of these had been lost and were revived anew by the project. As Sadhu Majhi of Tangiri village points out, “The resilience exhibited by our traditional millets is noteworthy. They adjust to different ecological conditions and are environment friendly. These crops are grown purely under organic agriculture and require meagre investment.”All these make millets indispensable for rain-fed, tribal and hill agriculture, where crop substitution is difficult. Tuber crops constitute another important variety for the region. They are a good source of carbohydrates and minerals for a chronically calorie-deficient population. The consumption of tuber, especially among the rural populace, can limit the chances of nutritional anaemia to meet the daily allowance. Besides, given the high potassium content, they protect consumers against hypercalciura, kidney stones, and osteoporosis. Agragamee, with the support of IPAP, organised a series of training programmes on tuber crops and eco-friendly farming reaching out to more than 200 farmers in the region, out of whom around 120 are now cultivating these crops in their farm land and regularly including tubers in their diets. The diversification of crops not only provided a rich nutritional diet for the members of the household, but also supplemented the family income as the surplus was sold in the local haats. On an average, each farmer is now able to earn at least Rs 8000 to 15000 annually from his farm. These earnings have enabled them to strengthen their social assets too, in terms of repairing their houses, purchasing bicycles, bullocks and other household needs. In 2010, 30 farmers started a variety of trials on small patches of land. Although uneven distribution of rainfall affected sowing and yields, the seasoned, determined, and experimental farmers continued trial cultivation. By 2014, already 200 farmers were cultivating a range of millets that had not been cultivated for over a decade. Now, the number of millet varieties being grown has expanded to four, tubers to five, and eight different leafy vegetables have been identified for cultivation. The practice of seed purification by seed selection, which had been abandoned for over a decade, has been taken up once again. The interest shown by the farmers to grow traditional seeds has been encouraging and shows that farmers still value their traditional agro-biodiversity. Given a choice, they will adopt it. Around 200 instances of seed exchange have taken place at the village and panchayat levels since 2011, all of which have enabled farmers to get back some seeds that were lost from their area. Farmers also set up seed banks in the village to conserve the traditional varieties. More than 80 farmers initiated individual seed banks in 12 villages. A seed-scarce community has been transformed into a seed-sufficient one. Panmati Majhi of Chirika village is very happy with the results. “Agragamee has taught us that our own plants and crops are the best ones as they can cope up with local climatic adversities, have great potential for good yield and are highly nutritious. We just need to preserve these and multiply the amount of seeds every year.”This observation from a tribal woman drives home the pressing need to preserve and promote local seed exchanges. Farmers are now taking a keen interest in organising meetings at the village and panchayat levels. The Women’s Resource Centre at Adri has turned into a grassroots-level platform for discussion and sharing of what is being cultivated, the inputs used and the yields obtained. Exposure visits have also been organised for farmers to various places within the district and the state. These have in turn led to an increasing exchange of information and debates on traditional seeds, farming systems, diversified food and their cultural practices. 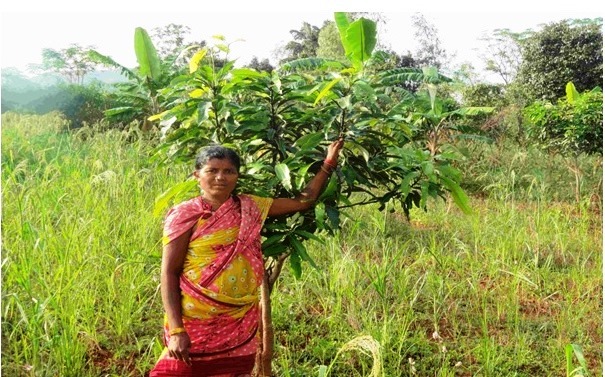 Sobhini Muduli – a woman farmer of Gunjmalipada village of Adri panchayat, has set an example in orchard plantation and intercropping in her two acres of patta land. According to Sobhini, things were very different before the practice caught on. Agriculture depended largely on the monsoons; villagers cultivated mono-crops and yields were subject to the timing and quantity of rainfall. In the event of irregularities in rainfall, farmers even failed to recover the seeds that were sowed. As time went by, farmers gradually became reluctant to cultivate traditional seeds and started using modern hybrid seeds. Sobhini recalls that the initial harvest was bumper, but slowly, as more pesticides and insecticides were required, it considerably increased the cost of production. At the same time, the yield too decreased over time and was uncertain. These forms of subsistence agriculture barely ensured food security for a maximum of four to five months a year. The real struggle started during the lean season, when lack of employment opportunities and livelihood needs drove farmers to migrate. Farmers had lost their faith in agriculture and Sobhini was no exception. But life changed when she became one among the first 35 farmers chosen as beneficiaries for the Wadi project, under which she was provided with 40 mango and 20 lychee saplings. In the years since, she gradually started cultivating a range of grams, pulses, millets and vegetables in the space of her farmland. Today, Sobhini no longer needs to use chemical fertilisers and insecticides, which are exorbitant and decrease soil fertility. Farm yard manure is extensively used and organic pesticides are prepared from neem cake, karanja oil and cow urine. Last year, she received a bumper harvest of 100 kg of finger millet, 50 kg of fox millet, 70 kg of pearl millet, 100 kg of arhar and 80 kg of niger. Besides, a range of vegetables and elephant yam have also been cultivated; the produce was primarily used for household consumption and the surplus sold at the local haats. Sobhini has already identified and preserved the best, mature seeds for next year. “It is like a day dream for me. Nowadays, we have a variety of vegetables, pulses and millets at our home to cook. My daughter is fond of vegetables, and I feel very happy to be able to serve preparations of different vegetables to her and the family. Most importantly, her health is also improving due to availability of nutritious food,” says the visibly happy lady. Stories such as these exemplify how the tribal farmers of the 15 targeted villages in Kalahandi district have broken the barriers of mono-cropping by going back to a millet-based bio-diverse cropping system, and how this has resulted in overall increase in food security in the region. The experience of the community and the results hold several important lessons, which may be applied to other parts of the country.